Marketing & Social media lead. Loves tacos. Posted on Apr 19th 2017 We are excited! We have so much going on, and we wanted you to be the first to know all about our recent updates and new products. Like many of you, we wanted Eclipse looking vibrant. We wanted our IDE to make us excited, and not feel like we are still coding in the early 2000s. That’s how it all started, and the “Darkest Dark Theme” was born. Spoiler alert: it’s currently in the TOP 3 of the Eclipse Marketplace plugins, It has been downloaded over 50,000 times! (50,179 actually), and It’s free! Finally, the wait is over. Angular 4 is out, and of course, we made sure that our IDEs had it the first day. Not only that, but we worked in advance to make sure that you are able to update simply to Angular 4 with a one-click flow that does most of the steps for you, avoiding that tedious laundry list! Been waiting for the Stable stream to move to 2017? We’ve got good news! MyEclipse 2017 Stable 1 is now availablefor immediate download. It comes loaded with all the features above and all those good improvements that have been rolling out on the CI stream. If you enjoy the collaboration possibilities of Google Docs, you will love being able to code together with other developers, no matter where they are. CodeTogether will allow you to make real-time edits to shared code from within your editor or IDE (this includes Visual Studio Code, IntelliJ, Eclipse, Atom, plus our own MyEclipse, Webclipse and Angular IDE). While Eclipse already offers a dark theme, it comes with lots of limitations. We specifically attacked those limitations to be able to give you a fully dark theme with an impressive UI, very easy to turn on from your Preferences. It is completely customizable, and with icons specifically designed for a dark background. To use the Darkest Dark theme, simply head to the Eclipse Marketplace to the Darkest Dark entry or if you have MyEclipse just select it from Preferences > General > Appearance. It’s also simple to customize your editor colors when using the Darkest Dark theme. Simply go to Preferences>General>Appearance>Darkest Dark and select the editor colors you prefer. 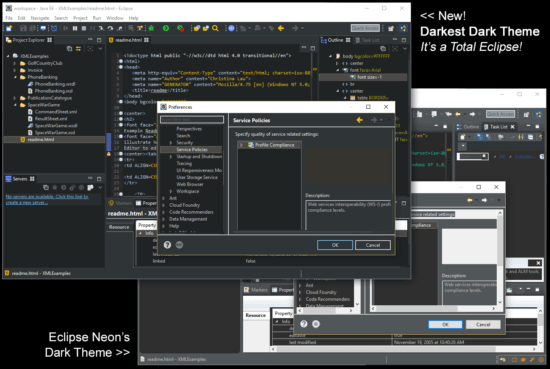 The Darkest Dark theme also works with an array of third-party plugins that you might add to your IDE install. When a plugin allows configuration of a color in Preferences (Colors and Fonts), the Darkest Dark theme will automatically create an alternate color that looks nice with Darkest Dark.